Using specialist coatings for stainless steel we can offer many solutions. The aim is to either further protect the material, enhance the performance or improve the aesthetics of the material. Black Nano coating of stainless steel – this goes over a brushed finished to enhance the looks. Growing in demand for kitchen appliances easy to clean resistant to wear, UV resistant and doesn't migrate to foods. Ideal for domestic appliances. Anti finger print coating – easy to clean to remove finger prints, resist stains designed for indoor use. perfect for door plates and kitchen appliances. Epoxy foam bond coat – designed to make bonding of materials such as foam to stainless steel very easy. No need to apply harsh grinding that may damage stainless steel and lead to corrosion or flatness issues. Used for cold rooms and truck refrigeration or lift panels. TiN coated stainless steel – a PVD coating in gold or champagne protects the brush coating by applying a hard layer >9H ideal for architecture to protect the surface. 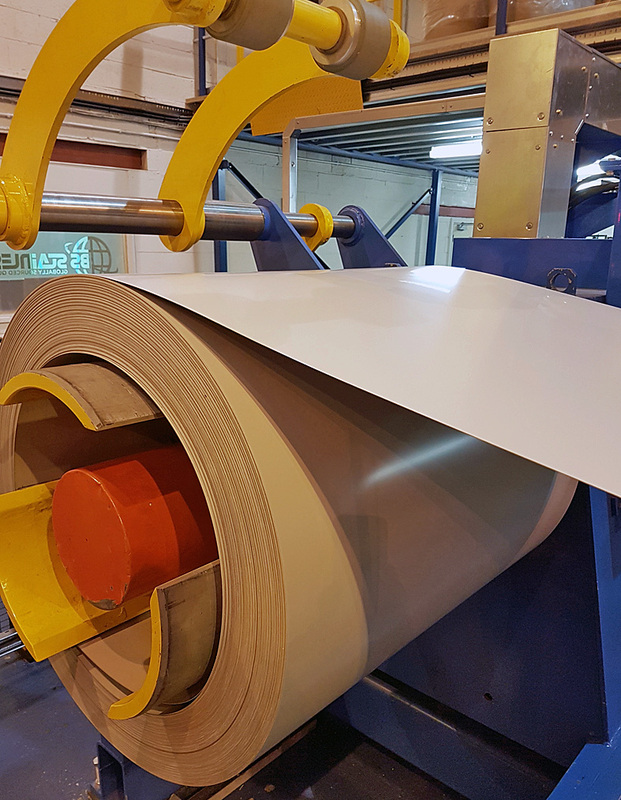 Drawing coating – protective and lubricant coating in order to increase the drawing properties of stainless steel instead of protective coating. Protective coating can disintegrate or get stuck in machines. This innovative coating replaces peel coating so avoids waste. The coating can be removed with hot water and has low environmental impact (VOC free). Ideal for panels, doors, casings and control panels. Extra strong coat – four layers of PVDF supplied in many colours. Similar to our ColorMet product but 70 µm thickness to further enhance corrosion resistance, UV resistance ideal for sever environments. In addition we can apply these coatings to many other substrates Aluminium, Carbon steel, zinc and Aluzinc. For more information on these coatings please contact info@bsstainless.com or speak to our coating experts on +44 (0) 1772 337555.